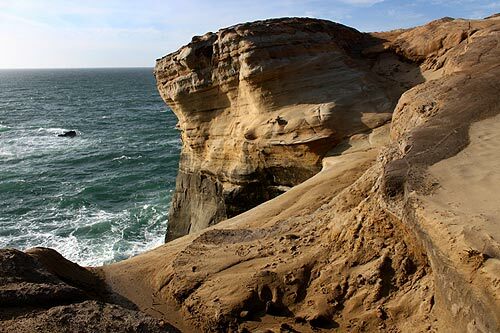 (Pacific City, Oregon) – What's not to love about the north Oregon coast icon of Cape Kiwanda? 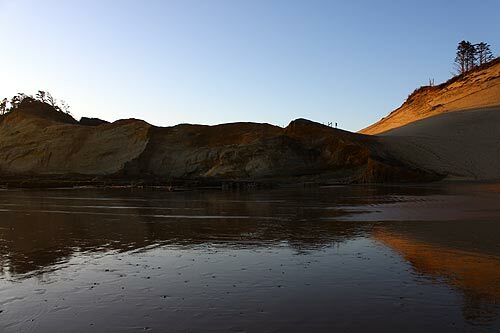 The wonders never cease on top of these golden, weather-sculpted cliffs - the centerpiece to a tiny town that just seems to have exploded in 20 years. Offshore sits the stately Haystack Rock, almost as if it guards these cliffs and Pacific City. And maybe the throngs who visit as well. It's an engaging, enthralling place to a lot of people. 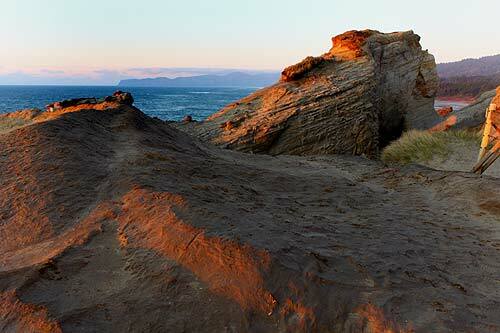 That includes Portlander Pilar French – a sort of groupie of Cape Kiwanda, it could be said. With her furry friends in tow, a couple of multi-colored dogs that both come with striking eyes – she's more than a regular. It's a leg-breaker going up to discovered what French and her furry family are well aware of. But worth it. Scale to the top of the cliffs via a strenuous incline made of loose sand that makes it even harder. Once there, incredible sights await, such as wild, craggy structures with weird color schemes, resembling another world. 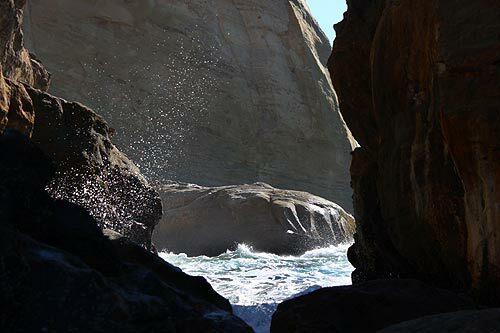 There are secret trails leading you to more stunning viewpoints, and a small cove with minute cracks in the rocks where the tide can sometimes squirt out. It's the gateway to a stunning, even sometimes alien landscape, serving up hidden glimpses of parts of the cliff which jut and wriggle their ways out into the ocean. There's a nearly endless parade of incredible viewpoints you can't get anywhere else in the area. 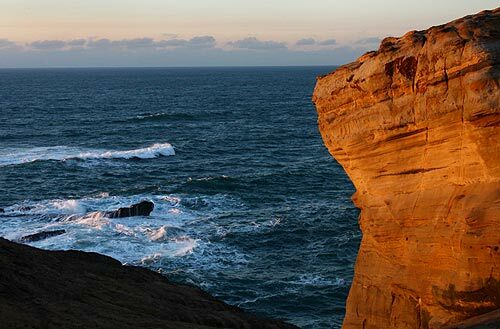 And on sunny days, the cape becomes especially entrancing as the sun sets the cliffs on fire and causes the tumultuous water below to turn a deep, dark blue in stark and unforgettable contrast. The entire area is one remarkable package of natural fun and frolic, rambling on for several hundred feet in different directions and hiding numerous treasures all over. Zip up the huge sandy hill to its top and explore the mini-forest there, or let yourself tumble its long, steep expanse, as many children do. You'll see them shooting down on boards of various kinds - sometimes with more than one piled on top - or in some cases, even by intentionally tumbling themselves to the bottom. At its base, a world of mesmerizing little tide pools appear along the rocks at low tide, sometimes opening up sea caves for your inspection. The dune on top inspires kids of all ages to engage in all sorts of sledding behaviors. 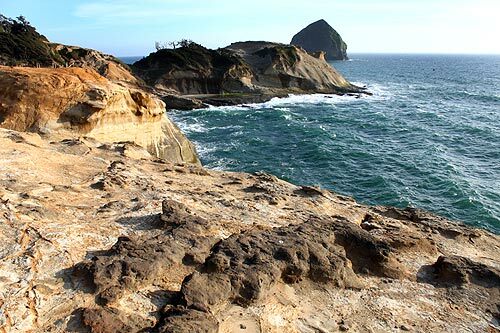 Pacific City is right at the southern edge of the Three Capes Loop on the north Oregon coast. More about the area below and at the Three Capes Loop Virtual Tour, Map.